A.W. Lucas Company, often shortened to A.W. Lucas or simply Lucas’s, was a local department store in Bismarck for over eighty years. For decades, A.W. Lucas continued to grow and expand at an unprecedented pace, cultivating with Lucas establishing itself an original anchor for Gateway Mall before closing in 1982. A.W. Lucas was established in September 1899 as the result of a partnership between Arthur Lucas and William O’Hara. It served as the first true competitor to long-time Webb Brothers, who actually welcomed the competition by providing financial support to Lucas and O’Hara’s new business venture. Lucas assumed full ownership of the store when O’Hara left the business in June 1902. By 1924, the store had outgrown its original location and relocated into an adjacent building. Lucas died in 1923. A.W. and O.E. Mundy purchased the store from Lucas’s estate two years later. Traditional for department stores of the era, a lunch counter was added to the basement in 1927. In 1940, Lucas vacated 25-feet of storefront from its location on the corner of 4th Street and Broadway Avenue when it added a second floor of the remaining store and modernized the exterior. Ell Torrence, A.W. Mundy’s son-in-law, became president in 1952. He held the position until dying in a car-pedestrian accident in 1968, at which point leadership transferred to his son-in-law, Mike Speaks. Lucas was awarded Champion Brand Name Retailer, a prominent honor at the time, in 1958. Lucas Fashions, a store targeted exclusively at women, opened in 1966 at 316 E Main Avenue. It was destroyed by fire in 1979. Lucas Men’s Wear opened at 316 E Broadway Avenue in 1968. In 1971, Lucas Fabric Shop opened at 112 N 4th Street. 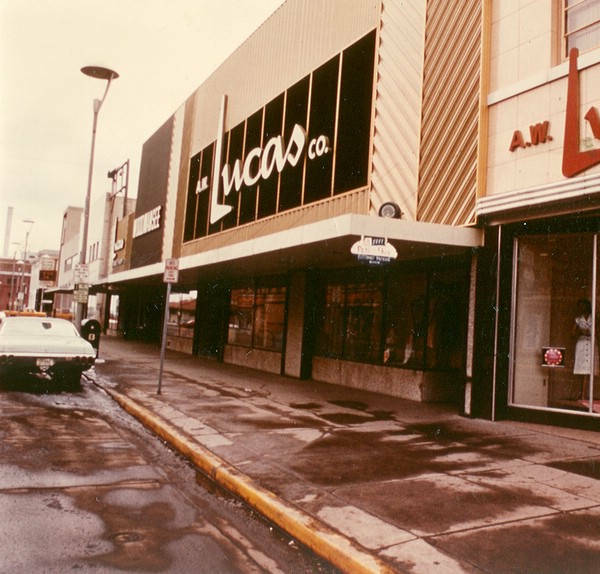 In 1974, Lucas returned to its former storefront at the corner of 4th Street and Broadway when it purchased the building that was then home to competitor Buttrey’s, who was leasing the space. Decades of growth ultimately led to A.W. Lucas concurrently maintaining four separate downtown locations, including its principle department store at 116 N 4th Street. In September 1979, A.W. Lucas established itself as an original anchor at Gateway Mall in 1979, where it consolidated its previously independent downtown locations. In fact, it was the first store to open at the new shopping center. At 45,000 square feet, its new anchor store was larger than all four downtown locations combined. A.W. Lucas closed permanently in 1982. Its Gateway Mall anchor space was take over by Moorhead-based Eckstein Department Store soon after, who itself was purchased by Herberger’s the following year. The original building that housed A.W. Lucas later housed Woodmansee’s Office Supply Store between 1929-2018. Its previous storefront at the corner of 4th Street and Broadway Avenue was home to Buttrey’s, a Montana-based department store, for many years. Today, it’s home to Toasted Frog. The final gold paneling of the former Lucas store was only removed in 2017. The space Lucas formerly occupied at Gateway Mall has seen several other tenants, most notably Herbergers, Jacobs Trading (World’s Greatest Deals), Conlin’s Furniture, and Famous Labels. Today, part of the space houses Harbor Freight Tools.